6739 Reynolds Street, Pittsburgh PA 15206. My boyfriend grew up on Reynolds street. In the past 5 years of our relationship, he has shown me every nook of his neighborhood, Point Breeze. We've spent hours wandering around under the BFG-sized trees, dreaming and falling in love. On most Friday nights, you can find us fighting over piping hot frites at the cute restaurant that sits perfectly on the corner, Point Brugge. Reynolds Street has had my heart for quite some time. 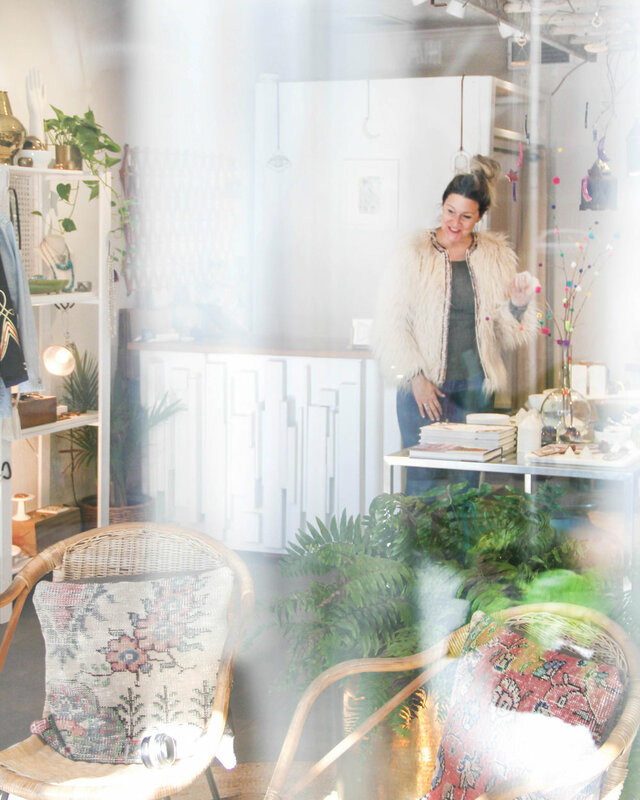 So, when Leslie opened her cute little shop full of magic smack dab on a street I dream of home, you could say I was instantly in love. Juju has become a place of sanctuary for me. When my mind and heart are feeling a little tug to be restored, I know that I can wander down Reynolds, slip into Juju, and feel happy and whole again. Juju has an energy to it. One that is not found in many places. I truly believe this is because of Leslie, the smiling, loving, owner who is always popping out from behind the desk in the quirkiest, coolest vintage. Oh, and because the shop is surrounded by hundreds of colorful crystals that are keeping the place vibrating. 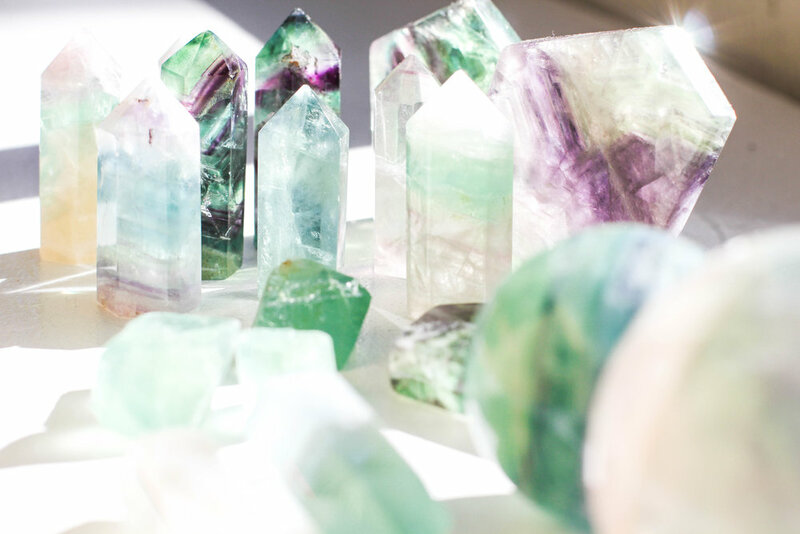 Truth be told: I've never known much about crystals. I've always bought some for myself or friends because I find them beautiful. Usually I'll buy one, put it in my pocket throughout the day. I love how they look in my decor, so for the most part, that's where they would stay. That is until I chatted with Leslie a bit, and learned her experience with crystals. Now, I'm buying with a purpose, and treating them with a new level of respect. 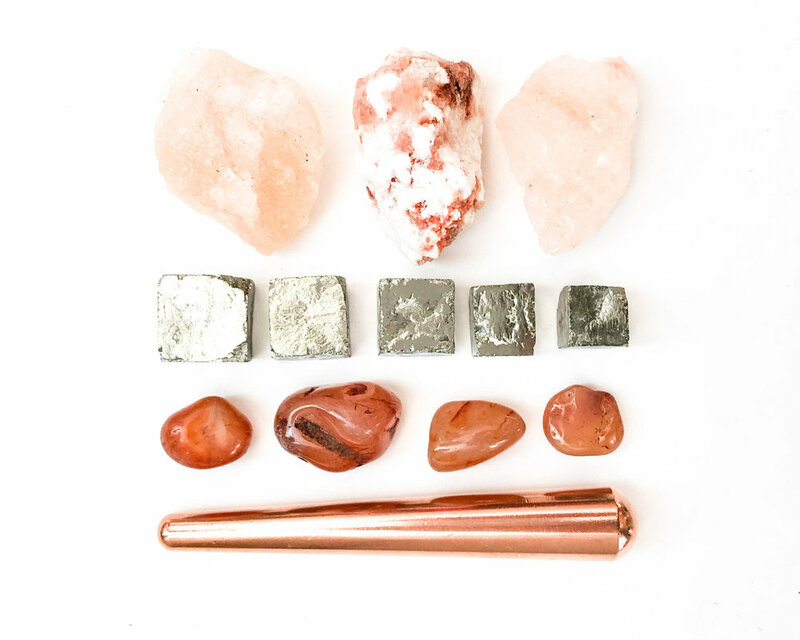 Top to Bottom: Himalayan Salt Rocks, Pyrite Cube, Carnelian, Copper Wand. This is the fire series. Copper is a conductor. Carnelian is great for blood flow and energy. These are the "just do it" of the mineral family. Rock salt ionizes the air, protects, and removes negativity. Left to Right: Morganite, Rose Quartz Point, Rough Star Rose Quartz, Rose Quartz Palm Stone, Rough & Tumbled Large Rose Quartz Chunks. These are the love stones. Give divine and self love. Left to right: Raw Fluorite Octahedron, Fluorite Points, Malachite, Fluorite Slabs. These are great for mental clarity. Malachite is the great stone of transformation and wonderful for traveling. Left to Right: Spirit Quartz Clusters, Fluorite Amethyst Points, Lepidolite, Amethyst Tumbled, Amethyst Cluster, Large Chevron Amethyst Chunks. Amethyst enhances intuition and dreams. Lepidolite has lithium in it and is good for anxiety. Spirit quartz is for divine spirituality. Me: Favorite 3 crystals and why? Leslie: You're asking me to pick my favorite child and this is borderline dizzying. I love them all for many reasons. It is important to note that they all remove negative energy, heal, connect us with our spirit guides, enhance intuition, dreams, and protect us. But since we are playing favorites, I'd have to go with Quartz, Fluorite, and Black Tourmaline. -Quartz is the ultimate healer. It's high vibe brings serenity and peace. It also amplifies other crystals, so if you need extra love, carry it around. -Fluorite is gorgeous, couplex, and calm at the same time. Some spheres can be deeply moody like a stormy sea. Others can be angelic and celestial like a pink sky. These are vacuums for negative energy and psychic balances. They naturally grow in chevron shapes, and if you hold them up to the sun, the shapes and colors will mesmerize you. -Black Tourmaline for life. The protector. The "evil eye" of the mineral kingdom. It protects from harm. It has protected me, and for that, I am fiercely loyal to this black beauty. Me: When and how did you get into crystals? Leslie: My mothers jewelry box. Malachite, Lapis Lazuli, Pearls, Jade. She wore necklaces and when she held me I would wrap my fingers around the beads and stare into them. I dare you to pick up a malachite rock and follow the patterns and striations that naturally occur in these green goddesses. These minerals and gems have had my attention for many years, but now it's a lifestyle and dedication. Me: What is one crystal that everyone should have in their collection? Leslie: Rose Quartz. We have got to love ourselves. Rose Quartz helps us to heal our "pain" so we can lessen the self doubt and self hate and truly love. It helps us to find love when we're looking, grow the love we have, and heal the love we've lost. Story goes, if Rose Quartz turns white, then you have successfully achieved self love. Me: In what ways do you use crystals? Leslie: Endless uses! Bath Rituals. Beauty Elixirs, I put them in my car for safety, on my bedside for restful sleep, under my pillow for dream enhancement. Me: How do you clean / energize your crystals? Leslie: Smudge them with your favorite bundle of Cedar, White Sage, or Palo Santo. Set them out in the sun and if the moon is full, leave them to charge. You can simply hold them and thank them, which is my nephews favorite method. Me: What's one good piece of advice to someone who has never used crystals before? Leslie: If you are new to the crystal game, don't get too panicky about choosing the right one. I say let it choose you, and then learn from there. Let it be a journey, don't force it. Leslie, thank you so, so much for letting me come and play. You've taught me so much, and I love making magic with you. *If you haven't been to Juju yet, please make a plan and stop by. You can thank me later.